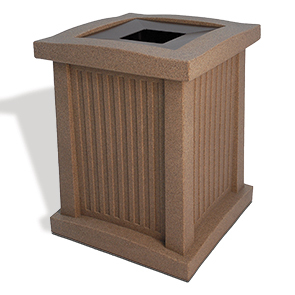 Made from impact and weather resistant recycled polyethylene, this 24 gallon square trash receptacle is lightweight and durable. Easy to wipe clean with simple soap and water, the polyethylene will not stain, rust, dent or chip. This unit performed outstanding in the long term weatherability (UV8) and environmental stress and crack resistance (ESCR) testing and is highly rated to withstand erratic climate conditions, making this unit perfect for indoor and outdoor use. Select popular color options are available to help your square column receptacle fit in but stand out and encourage responsible litter disposal.